Most people think of using their iPad for work as a Wi-Fi hotspot or tether, acting as a way station to the Internet for devices that don’t have their own cellular connections. A hotspot — whether a smartphone or a separate device — connects to the Internet over a 3G or 4G cellular network and then lets other devices connect to it over Wi-Fi. That makes it a bridge between the two, providing Internet access to those Wi-Fi devices when no Wi-Fi network is nearby. But hotspot devices, as well as tethering plans for smartphones, can be expensive. Some carriers allow for tethering as part of their data plans; others charge extra for the privilege. Plus, if you don’t buy a subsidized iPad from your carrier, you can turn the iPad’s cellular data on or off, so you pay only for one month’s usage at a time. That’s great if you travel irregularly and need a hotspot only occasionally. Because carrier plans vary so widely — and because there are often hidden charges, requirements, and limits — you need to investigate your hotspot options carefully to see whether the iPad approach is a better deal. In many cases, it is — even after factoring in the extra upfront cost of a cellular iPad model. Go to the Settings app on your iPad. Tap Personal Hotspot to open the Personal Hotspot pane. Set the Personal Hotspot switch to On. Note the name in the text below the switch that your iPad will broadcast to other devices. Enter a password that other devices will need to connect to the iPad via Wi-Fi. 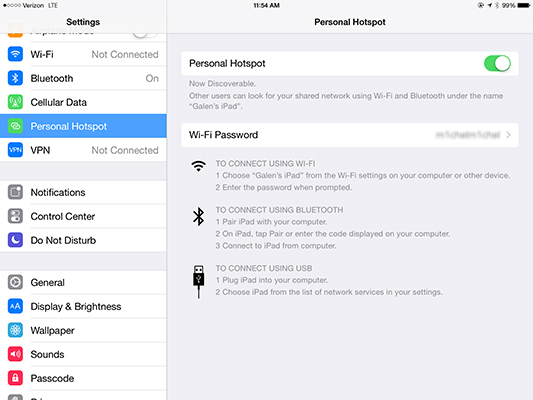 On your other devices, connect to your iPad (using the name shown in the Personal Hotspot pane) via their Wi-Fi controls, and enter the password you established on the iPad. As long as your iPad has a good cellular connection, the Personal Hotspot remains on, and those other devices remain wirelessly connected to the iPad, they can use the Internet. Just remember: The more devices you connect to the Internet through your iPad, the more you’re dividing up that Internet connection and thus reducing the available bandwidth for each device, slowing their access speed.